I wrote the following post in February 2009, two months after returning from my six month sabbatical in Arles, France. I was feeling a bit nostalgic this morning and started looking back through old posts. I didn’t have many readers then and the blog (and my writing) was just a baby. At that point, I wasn’t even sure that I would keep it going. New readers, I hope you enjoy this little step back in time. The Sabbatical Chef has returned to “real life.” As of today, February 15, I have been home for two months. I have resumed teaching at Durham Academy and have finally learned the names of my students. I have worked with Dorette at C’est si bon! (I continue to stress the fact that I am an assistant, not a chef!) I have taken over as president of the North Carolina Association of Teachers of French and survived my first board meeting. I moved in with my sixteen year old son and my ex-husband. (Steve got his passport, came to Paris, finally, and proposed at the top of the Eiffel Tower. What can I say? That story deserves its own entry and I will try to get it all in words soon. The headmaster at DA is taking full credit for our reconciliation since he gave Steve the time off to come visit me.) I have unpacked almost all the boxes and found most of my belongings, thank goodness. Grant’s two cats seem to like me and Rusty has stopped hiding from me. I went to Spruce Pine to visit my family in the mountains. They are very happy to have me home safe and sound but still do not understand what I was doing over there in the first place. I have a meeting tomorrow with the features editor at the Durham Herald-Sun newspaper to talk about the possibility of a new column. Life goes on, almost as if it was never interrupted. Life has a way of doing that, I have discovered. My six months in France seem dream-like now. I bring up iPhoto on my MacBook daily to look at a few photos, however, to remind myself that it really happened. Life in Arles goes on without me, too, of course. Wally has returned to Lisbon. Didier and Monique have closed their brocanterie on Rue de 4 Septembre. Business had not been good, unfortunately, for a while. They hope to open a tea room, if they can find a suitable space. Or Didier said he can always go back to work as a stock trader in Paris. (I was shocked to find out he had done this at one time- I told him he seemed much too nice for that line of work!) Business at Gilles’ bookshop has been slow, too. Although Christian Lacroix told the newspapers and magazines that he thought his exhibit at the Musée Réattu would be good for the local businesses, it didn’t really help much. The exhibit was a grand success, however, and was extended until December. The B&B is up for sale. No offers have been made, though, so Chef Érick continues to rent out rooms. He plans to continue offering his cooking classes and visits around Provence but is looking for someone who is computer savvy to help him set up a website and blog, as well as an English-speaking assistant for the spring and summer. Provence experienced its largest snowstorm in 21 years. 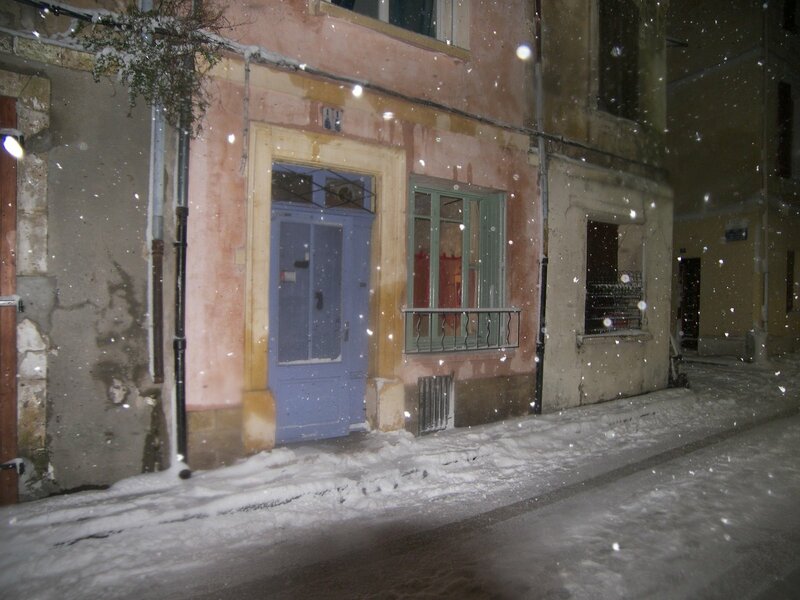 I begged Érick to go out in it with his camera so that he could send me some photos of Arles covered in snow. The posted photo is of the front door to the B&B. At one point in the summer, probably mid-July or early August, I thought seriously about making Arles my home. I wasn’t sure how to do that and didn’t even have a long-stay visa for the six months I was there (another story involving red-tape and passports). A guest joked that I could find a French man to marry. The pace of life suited me perfectly. I loved the guests and meeting new people every day. I could walk wherever I needed to go. I could feel my French improving daily. I ate like a queen- all the shrimp and mussels I wanted. Nice chilled rosé and Picpoul de Pinet. Lovely reds from Pic St. Loup. Moussu T e lei Jovents music. Drinks at dusk in the Place du Forum, gazing at the Van Gogh café (now painted to match his famous painting of Le Café la Nuit- but do not eat there. Lousy food and questionable owners.) But waves of homesickness would hit me like a ton of bricks every time I thought about my two sons. And I finally realized that I missed my life, my real life. When I put Martha and Monette on the plane in Marseille in mid-September and drove myself back to Arles on that early Sunday morning, I knew that I would be ready to fly home myself in three months. At that point in time, I still had no idea that I would come back to Durham and resume, in many ways, my life of four years earlier, before Arles ever happened to me in 2005. Only the new and improved version. Older and wiser but still young enough to appreciate and enjoy the changes that can happen if you are open and can let go of the past. I am asked repeatedly if I miss France. The answer is a most definite oui. How could I not miss speaking the beautiful language, enjoying long lunches and amazing conversation in that language, staring history in the face every time I walked down a street past a monument built over 2,000 years ago, walking through the market and smelling roasting chickens, herbs and spices sitting in open baskets, fragrant goat cheese, freshly cut lavender and lavender scented soaps. The scenery is a work of art and most of it has indeed been painted and photographed many times over the years, from the abbeys and churches to the fields of sunflowers and lavender to the Roman arenas and aqueducts. Provence is a feast for the senses. I have indeed brought some of it home with me. I have made lamb and tarte Tatin for friends (I couldn’t have made the tarte without Martha’s help and pan!). I have turned Grant on to the joy of freshly grated parmesan cheese on his pasta instead of the stuff in the green can. I have made French toast for him from my orange brioche. I sprinkle my chicken recipes liberally with herbes de provence as they cook in olive oil. I have shown a video clip of Moussu T et lei Jovents to my students and taught them the song “Forever Polida,” as well as “Le Tube de Toilette” by Boby Lapointe, a song that goes along with the vocabulary we are learning. I made a presentation to our middle school students on truffle hunting and showed a short video that I took with my camera. Martha and I are going to cook with the boys from the Durham Nativity School in March and teach them to make tarte Tatin. I am reading Death in the Truffle Wood by Pierre Magnan, a murder mystery that takes place in Provence. I’ll Never Be French (no matter what I do) by Mark Greenside, The Widow Clicquot by Tilar J. Mazzeo, A Pig in Provence by Georgeanne Brennan and Sixty Million Frenchmen Can’t Be Wrong by Jean-Benoît Nadeau and Julie Barlow are on the nightstand waiting for me. I consult Bistro Chicken by Mary Ellen Evans and French Woman Don’t Get Fat by Mireille Guiliano for new recipes once in a while. I check out Kristin Espinasse’s French Word-A-Day website two or three times a week for photos of Provence. In less than three weeks I head to Paris, Normandy and Senlis with 21 8th graders for our spring break trip. I continue to be a very lucky woman. Dissolve the yeast in the warm water and let stand for 5-10 minutes. Mix the butter, eggs, sugar, warm milk and orange flavoring. I have sweet orange essential oil that I bought at Florame (www.florame.com) and I use 4-5 drops of it. I know that you can find orange flavoring at the supermarket. Add the yeast mixture and mix. Add the combined flour and salt. Add enough flour to have a dough that you can knead (not too sticky). Turn onto a flour covered surface and knead for about 5 minutes or so. Place in a bowl and cover with a kitchen towel. Place the bowl in a warm place to rise. My microwave is above the stove and is a great place. Allow to rise for 2 hours. Turn onto a flour covered surface again and knead for another 5 minutes. Shape however you wish– into rolls, two small loaves or one large one. Place in pans. Cover again and allow to rise for 2 more hours. After the second rising, you can bake or you can put it in the refrigerator overnight and bake the next morning (allow the dough to come to room temperature before baking). Brush with the egg yolk and bake at 400F for about 20-30 minutes. Baking time will depend upon the shape of your brioche. Rolls take a shorter time. Adjust the oven, if necessary, lowering the temperature a bit if it seems to be baking too fast or if your oven tends to be on the hot side. After baking, while still warm, brush with preserves (you can warm them in the microwave so that they brush easily- I have also used orange juice at this point, when I didn’t have any preserves) and then sprinkle lightly with sugar. I have mixed orange essence in with the sugar before sprinkling to give it more orange flavor. As you can see, I have played around with this recipe. It is wonderful hot from the oven. It makes really good French toast when it is a couple of days old and a bit stale. It is also good sliced and toasted. It is not very sweet. French pastries and desserts are not as sweet as American ones. Enjoy! And please let me know if you make it and something just doesn’t work or you make a modification that helps! It isn’t perfect yet! A work in progress! Mix everything together. If desired, however, you can mix the “dressing” ingredients separately- lemon juice, olive oil and mustard- and pour over the salad. This is good warm or cold. I like it at room temperature so that the olive oil warms up. I sprinkle on the sea salt just before eating. Sometimes I use leftover pasta instead of the rice. I leave out the chick peas when I use pasta. **Here’s the link to the original blog- I still maintain it, but for some reason, I am running it on two platforms. Je ne sais pas pourquoi.